Opened in April 1993, the St Mungo Museum of Religious Life and Art explores the importance of religion in lives across the world and throughout time. 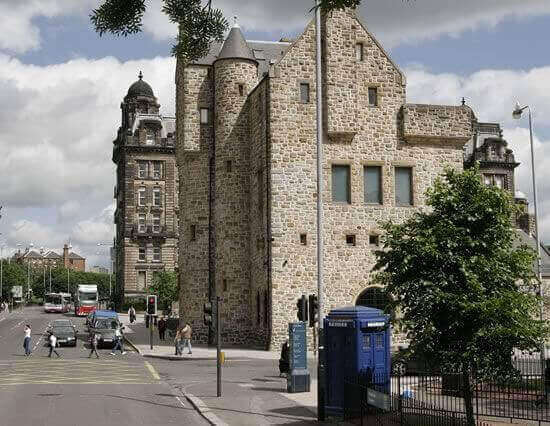 The museum is a modern building nestled between two of the cities oldest buildings: the magnificent gothic Glasgow Cathedral and Provand's Lordship (the oldest house in the city) yet, is only a short walk from one of the cities busiest shopping areas, Buchanan St. The three floors of the distinctive museum are divided into three main exhibition areas: the Gallery of Religious Art, the Gallery of Religious Life, the Scottish Gallery and a temporary space for seasonal exhibitions. Illuminated by vast, detailed stained glass windows portraying religious figures and scenes, the Gallery of Religious Art is home to one of the worlds most famous religious paintings "Christ of St. John of the Cross" by Salvador Dali. Visitors may also reflect on the awe inspiring figure of the Hindu God Shiva, lord of the dance. Whereas in the Gallery of Religious life you can explore the worlds six main religions Buddhism, Christianity, Hinduism, Islam, Judaism and Sikhism, hearing people of all religions speak of their faith and experiences. At the Scottish gallery you can peacefully contemplate in Britain's first permanent Zen garden, marvel at the beautiful 'sharing of faiths' banner, celebrating the union of the many religions residing in Glasgow today or learn how religion has moulded the culture and beliefs of people in the West of Scotland from the early ages to this day. The Museum is open 6 days a week and is situated 10 minutes walk from Buchanan St. Bus Station and Subway, as well as Queen St. train Station. Free guided tours are available, as well as a Gallery shop, Café and wheelchair access.